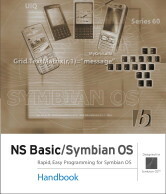 NS Basic/Symbian OS is no longer being marketed. is a complete, powerful development environment. Write your BASIC program on the desktop, then download it to your device to run it. NS Basic/Symbian OS no longer available. We will continue to support our existing users by keeping the NS Basic/Symbian pages available on our website. Adds over a dozen new features and fixes, including BlueTooth and IrDA comms. NS Basic/Symbian OS Web Board! Want to get the latest news and discussion? It's posted to our web forum first. Early results show good performance. Read the full results. We've put together a list of the most asked questions with answers. If your question isn't there, let us know!. See the complete list of statements, functions, datatypes and objects that NS Basic/Symbian OS supports. © 2019 NS BASIC Corporation. All rights reserved.